Labour Leave’s Brendan Chilton has said that Brexit is not a party issue and Labour and the Conservatives need to “work together” so that the UK can go on to “prosper”. Brendan Chilton, the General Secretary of Labour Leave told talkRADIO’s Julia Hartley-Brewer: “I think the majority of people knew what they were voting for but unfortunately we have got a situation where some of our politicians are not prepared to accept that. “They are not prepared to listen to the people. “I think what needs to happen is that the Labour Party and the Conservative Party need to actually work together on this. “This is not a party issue and there is no such thing as a hard right Tory Brexit or hard left Labour Brexit; there is just Brexit. Responding to the news that celebrities are helping fund bus journeys to get people to the “People’s Vote” march on October 20, Mr Chilton said: “The biggest problem Remainers have got right now is that they are organising buses to bring people down to London. “I encourage anyone who wants a free day out in London to hop on that bus and have a great day out. “The problem they have got is that they are trying to get us into a position where we don’t actually leave the European Union. “That is unacceptable. The people voted in the referendum to leave the European Union. Why would you leave the European Union but stay in its customs union, and stay in its single market? Figures such as TV chef Delia Smith, former Deputy Prime Minister Michael Heseltine and former Foreign Secretary David Miliband are among those contributing to the cost of coach travel to a march in London calling for a referendum on the final Brexit deal. 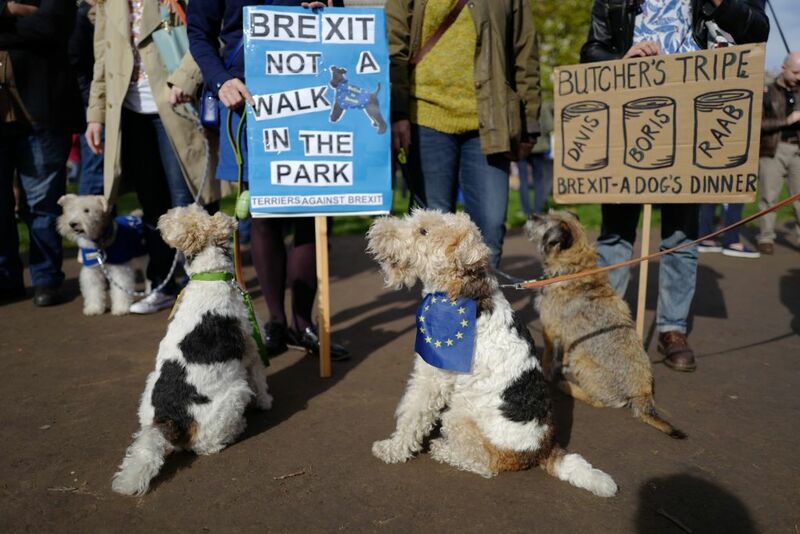 This follows after a march on Sunday in which dogs and their owners marched to Parliament Square to demand a “People’s Vote”, organised by the Wooferendum campaign.